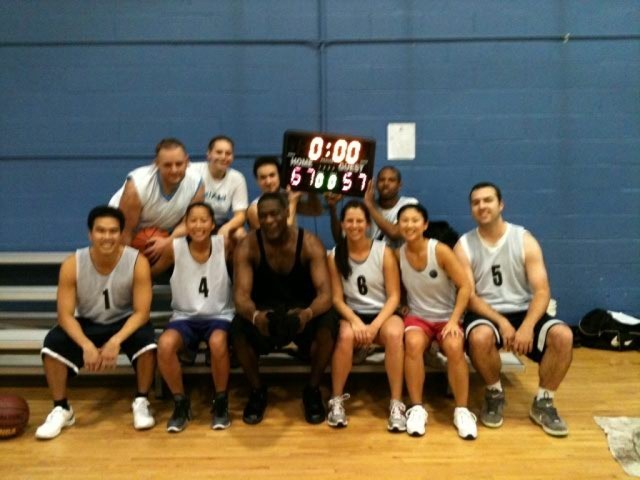 As I mentioned a couple blog posts ago, Micah and I are playing basketball together in a co-ed league. Today, we had someone very special join us on our team. My friend Jessica and I recruited him last night. He just happened to be at the same bar (which he owns), that Jessica’s birthday party was also at. He was a cool guy and he even got us a round of drinks. He was so cool, that when we invited him (not being serious at all) to come play with us at our game tomorrow – he was totally down. Of course we let all our team members know about this special addition to the team (via very excited text messages) – and then it was a matter of if he really would show up. Can you spot our special guest? For those who don’t have a clue of who I’m talking about – it’s Shawn Kemp – he used to be one of the premiere (aka BADASS) power forwards in the NBA…playing much of his career with the Seattle Supersonics. Pretty cool. And he still has game. He obviously didn’t play all out – that would be a little unfair. But he had some good rebounds, some good assists, and one nice little dunk (that was very fun to watch). We even have his digits now…so next time we need a sub – we can just call him directly.